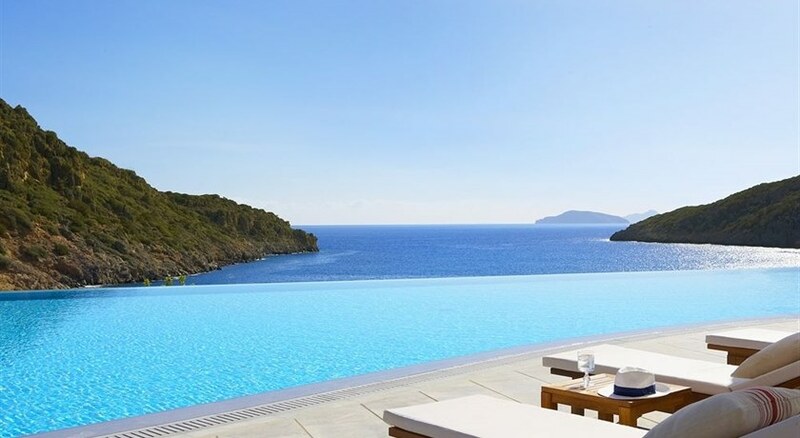 Daios Cove Luxury Resort & Villas is an all-inclusive family friendly 5-star hotel nestled on a hillside overlooking its private bay on the scenic island of Crete. North-East part of Crete. Daios cleverly melds five-star luxury and an elegant ambience with a friendly, unobtrusive and warm service. Featuring 2 lovely indoor pools, an outdoor temperature controlled infinity pool, three restaurants, spa, a fitness centre and a kids’ club it invites guests for a comfortable stay with modern amenities. The well-appointed contemporary guest rooms, suites and individual villas come with free Wi-Fi, personalized pillow menu, flat screen TV with iPod access, and coffee/tea maker. The en-suite bathrooms are marble-lined with separate bath tub and rain shower. Daios Cove Luxury Resort & Villas is nestled on a hillside overlooking its private bay on the scenic North-East part of Crete. The fishing village of Elounda is a 20 minutes’ drive, the hotel is a 10 minutes’ drive from Agios Nikolaos and 67km from Heraklion International Airport. The elegantly designed and contemporarily furnished guest rooms, suites and individual villas at Daios Cove offer spacious accommodation and gorgeous views from the balcony. These come with free Wi-Fi, personalized pillow menu, flat screen TV with iPod access, and coffee/tea maker. The en-suite bathrooms are marble-lined with separate bath tub and rain shower. The hotel offers a total of 300 rooms for its guests. Guests can choose from deluxe rooms, suites, villas and one bedroom apartments. 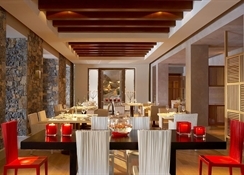 Daios Cove Luxury Resort & Villas has a clutch of bars and restaurants where guests can enjoy their palate. Taverna by the water’s edge serves delicious Greek cuisine and fresh sea food. Ocean serves light international fare a la carte. The Pangea offers a lavish breakfast overlooking the pretty cove. Daios Cove Luxury Resort & Villas has a swimming pool and kids’ pool and terrace besides having access to the beach. There is Yoga classes and a fully equipped gym for those who wish to stay active. There is a lovely spa with steam room offering massages and therapies. Tiny tots can have fun at Kid’s Club or Playground. The hotel has facilities for Darts, Table tennis, Games Room and Billiards. The hotel can arrange diving, windsurfing and sailing and other water sports. Guests can also shop at the shops on-site. There is lively evening entertainment. There’s a 2,000 square metre conference centre at the hotel.